I found myself loaded with fresh veggies and a full container of Greek yogurt, among plenty of cheese. So dinner became a glorious hodge-podge of veggies and dip, crackers with cheese and hummus, kale chips, and a small fruit salad. Truthfully, it was delightfully refreshing and filling! Many summer afternoons in my house are accompanied with veggies and dip. Although this was a wintery day before Thanksgiving, we needed the bright memories of warmer weather. I sliced up the veggies and was ready to begin my dip. Usually I mix it together in a large bowl. But I have been dying to try out a dip in my new Vitamix Aer container. I dumped in the Greek yogurt along with the lemon juice and olive oil. I’ve found that this container works best when I place the liquids in first. My favorite part about this veggie dip is the herbs. I mix and match flavors, dump and shake herbs, sprinkle and dash seasonings into the Greek yogurt. Because the yogurt is simply a carrier for fantastic flavors! If you haven’t used seasoning salt or celery salt, consider purchasing some. I was cautious at first, assuming that I wouldn’t use these seasonings often. You’ll be surprised how easily they blend with other flavors! Speaking of blending, this dip mixed together perfectly in the Vitamix Aer container. I ran it on medium for about 20 seconds until I visibly saw the ingredients combine. I swiped a carrot through it to note if the seasonings needed adjusting. As I suspected, it needed more dill! Another stir over medium speed and the dip was ready to serve. 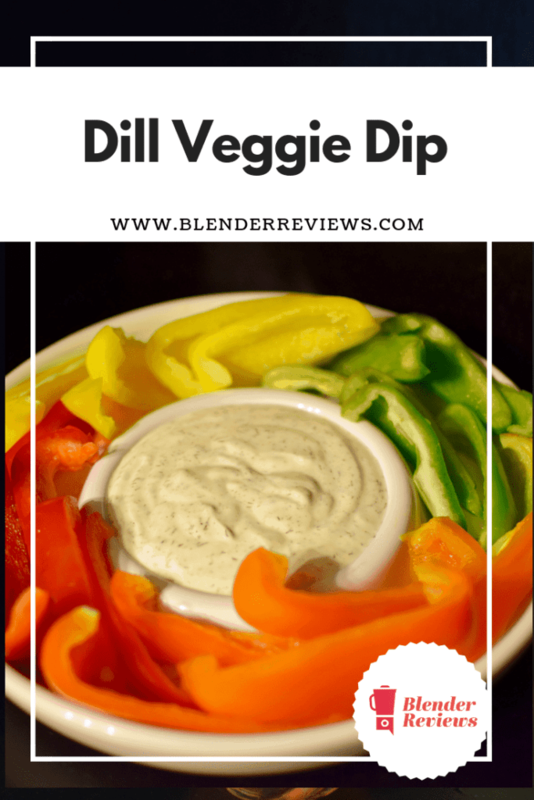 This Dill dip is healthy and flavorful since it's made with Greek yogurt. Serve with fresh veggies, crackers or chips as a refreshing snack or appetizer! Add the lemon juice, olive oil and Greek yogurt to the Vitamix Aer container. Blend on medium for 20 seconds until fully incorporated. Adjust the seasonings to suit your needs: add more dill to make this a veggie dip, or lesses the salt to serve with chips or crackers.